Dr. Lucy’s – Search Engine Optimization | ASTRALCOM - Content Strategy, Conversion Marketing and Customer Acquisition. 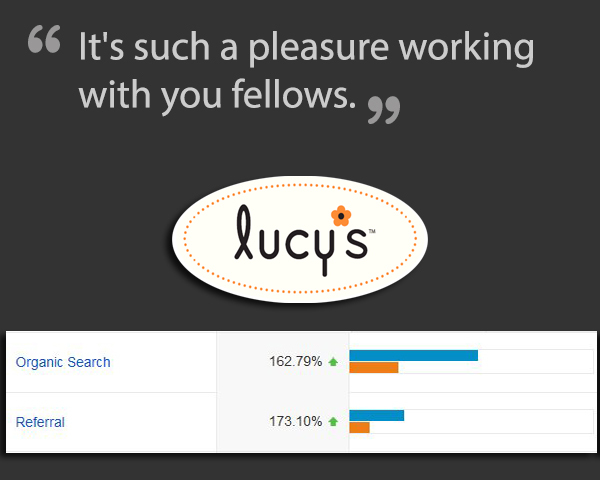 Dr. Lucy’s – Search Engine Optimization | ASTRALCOM – Content Strategy, Conversion Marketing and Customer Acquisition. 162% increase in organic search traffic! 73% increase from referring sites! There are two prime areas we aggressively worked on for Dr. Lucy’s. With wholesome triple-digit increases in organic search traffic and in referring traffic, it’s no wonder Dr. Lucy’s asked ASTRALCOM for more. We’re happy to oblige, too. And we certainly don’t mind receiving the healthy and delicious snakes that Dr. Lucy’s makes! Get the targeted traffic your business deserves, contact ASTRALCOM today.